The Trembling Line was the result of Aura Satz’s year as Artist-in-Residence at the University of Southampton, funded by The Leverhulme Trust and University of Southampton. Filmed with support in kind from ILIad, University of Southampton, with special thanks to Stephen Caspar and Joe Brett. High-speed sequences filmed with Quench Studios. Support in kind from Gallo Speakers. The Trembling Line was an exhibition by Aura Satz of new work at John Hansard Gallery exploring acoustics, vibration, sound visualisation and musical gesture with an aim to wrest the space between sound and image, to see how far these can be stretched apart before they fold back into one another. The title, The Trembling Line, refers in part to the basic principle of vibration, a disturbance of equilibrium, such as the stimulation of motion and sound through friction, but also to the possibility of challenging static notation systems and destabilising the experience of seeing and hearing. The centre piece of the show was the film and sound installation The Trembling Line, which explored visual and acoustic echoes between decipherable musical gestures and abstract patterning, orchestral swells and extreme slow-motion close-ups of strings and percussion. 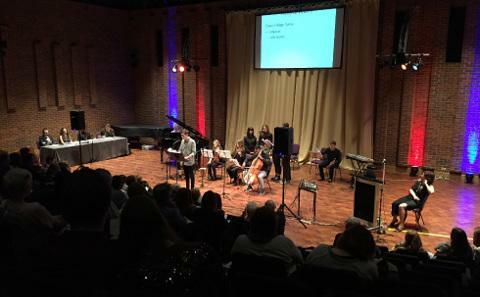 It featured a score by Leo Grant, projected through an innovative spatial audio rendering system built by the Institute of Sound and Vibration Research (ISVR) as part of the S3A research project on immersive listening. The residency represents an innovative collaboration between the artist, the Department of Music and the Institute of Sound and Vibration Research (ISVR) that explores the conceptual translations between different art forms, acoustics and technologies, and reflects ongoing exchanges between the composers, performers and acoustic engineering staff and students. ISVR collaboration was coordinated by Dr Filippo Fazi. Many of the 3D audio technologies were developed by the research team of the S3A project, an EPSRC-supported programme grant. The researchers who contributed to the development of the technologies at the core of the advanced spatial audio reproduction system, including those at ISVR, are engaged in the project “S3A: Future Spatial Audio for an Immersive Listener Experience at Home”. S3A is an EPSRC-supported programme grant carried out in collaboration between the Universities of Surrey, Salford, and Southampton and the BBC. How do we make sense of slavery? How can we represent its legacies? 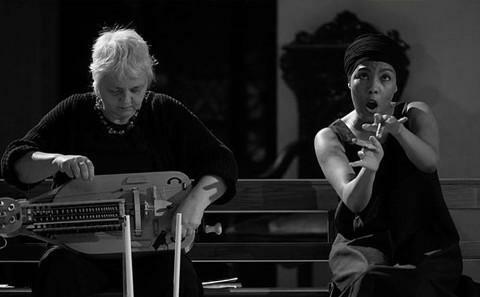 A historian, a vocalist, a choreographer and other musicians explore the past and its residues. ‘A musical by the people for the people’, a community driven project to create an educational, emotional, provocative musical of Fidel Castro’s life.